The Social Life is a custom apparel and lifestyle company focused on delivering premium products to the college market. 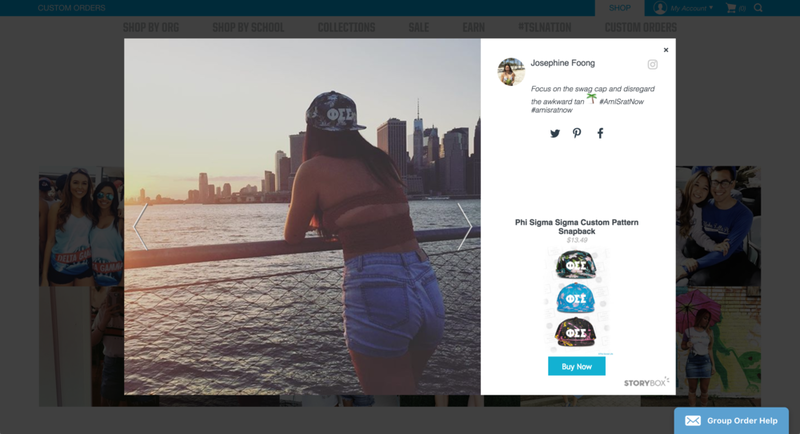 Through unparalleled innovation in product design, marketing, apparel manufacturing, and e-commerce, TSL is changing the way Fraternity and Sorority members order custom apparel. TSL is now a household name on every major college campus in the United States. The youthful, creative, and carefree lifestyle that is embodied in The Social Life brand carries through to our office design, our after-hours events, and the way individual members of our staff live their lives. Clicking on any photo tile opens a lightbox where the customer photo or video is displayed. Additionally, you can see who posted the photo (and verify it's a real person), see what they said about The Social Life, share the photo, and even shop the products shown in each image. 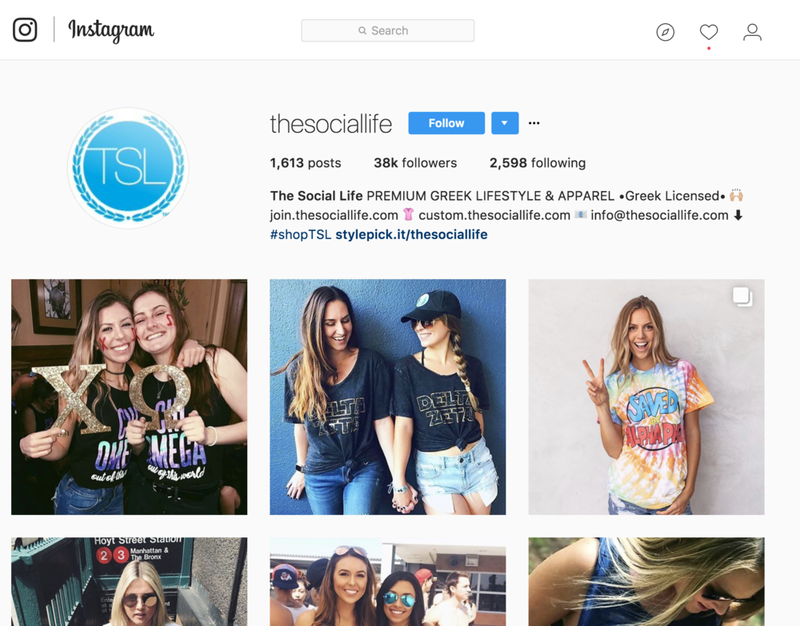 The Social Life created a dedicated page on their website to allow customers to shop the looks that they see on Instagram. 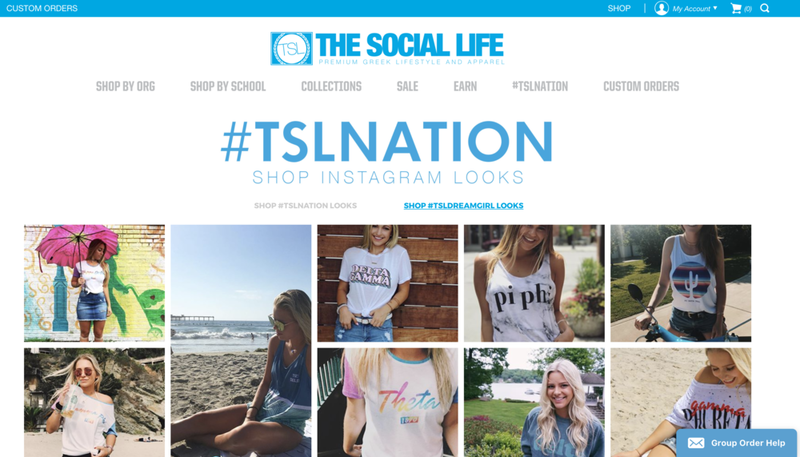 They highlighted this page in their website header with #TSLNation - this is a great way to immediately alert website visitors that you are a socially conscious brand. Their Shop Instagram Page allows for website visitors to see two different galleries: #TSLNation Looks as well as #TSLDreamGirl looks. To implement this, The Social Life utilized two different StoryBox Display Modules: our StoryWall (for #TSLNation) and our StoryFall (for @TSLDreamGirls). Each gallery displays photos that The Social Life team has found on Instagram (via StoryBox's dashboard) and approved to display on their website. Customers can now easily shop these images. The Social Life also made their Instagram profile shoppable. By adding their Stylepick link to their website bio, customers can easily purchase the products TSL features on Instagram with a two clicks. The Stylepick URL takes users to an intermediary page. This page recreates TSL's Instagram feed, but makes each image shoppable. This is a simple way to drive more sales & traffic directly from the Instagram app.